Most of us know that the Bible is sometimes also called “The Good Book”. I believe it is referred to as such because it is the Word of God and God is good. Even so, we do see bloodshed in the way of murders, rapes and wars. There are also many accounts of lies and other evil deeds that we can read from this “good book”. It is sad to know that many people even do these horrible things because they believe God told them to do it! The fact of the matter is that we must accept the evil with the good of the Bible or else the honesty of God’s Word might be missed because sometimes that evil is turned around and used for good. 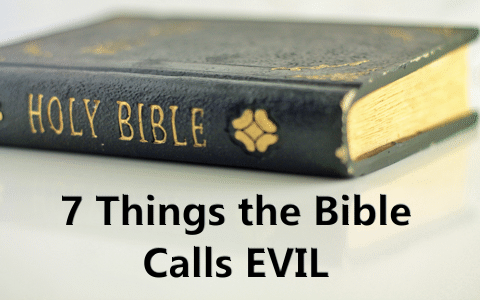 Truth be told, there are so many things that the Bible calls evil, so for the purposes of this article, I will list just 7 things the Bible calls evil. To desire something is to have a strong feeling or wanting to have something or wishing for something to happen. While there is nothing wrong with wanting something, the desire for something evil is wrong. Another name for this might be lust. The Bible warns us against evil desires. That tongue! One of the smallest members of our body – but oh! What damage it can do? (James 3:5-10). Speaking evil includes not only back biting, slander and gossip, but it also includes every word that comes out of our mouth. Conversations and jokes that include vulgar language is also evil speech. Here are a few passages that talk about evil speech. Psalm 10:7 His mouth is full of cursing and deceit and fraud: Under his tongue is mischief and vanity. Proverbs 16:27 An ungodly man diggeth up evil: And in his lips there is as a burning fire. Closely related to evil desire is thinking about evil. Actually, before we ever have an evil desire we must first have evil thoughts. For this reason, we should be careful to think on or “meditate” on the right kinds of things. The Bible cautions us to repress evil thoughts and think on good things. Proverbs 15:26 The thoughts of the wicked are an abomination to the LORD: But the words of the pure are pleasant words. Matthew 15:19–20 For out of the heart proceed evil thoughts, murders, adulteries, fornications, thefts, false witness, blasphemies: These are the things which defile a man: but to eat with unwashen hands defileth not a man. A specific type of evil desire is known as greed. Generally, greed is a selfish desire for wealth, power or food. It is that point at which you are desiring more than you need. Greed can be traced all the way back to Old Testament times and was, in fact, the thing that started many wars. Here are some passages the speak of greed in the Bible. Proverbs 15:27 He that is greedy of gain troubleth his own house; But he that hateth gifts shall live. Luke 12:15 And he said unto them, Take heed, and beware of covetousness: for a man’s life consisteth not in the abundance of the things which he possesseth. Some things are just not for us to know. Yet, there are times when we think we know better than God and go against what He said. An example of this would be when the men looked upon the ark of the LORD when they were given instruction to never look upon it. God killed them all … more than 50,000. You can read more about that in 1 Samuel chapter 6. Here are a few other examples of idle curiosity from the Bible. Proverbs 25:2–3 It is the glory of God to conceal a thing: But the honour of kings is to search out a matter. The heaven for height, and the earth for depth, And the heart of kings is unsearchable. John 21:21–22 Peter seeing him saith to Jesus, Lord, and what shall this man do? Jesus saith unto him, If I will that he tarry till I come, what is that to thee? follow thou me. Acts 1:6–7 When they therefore were come together, they asked of him, saying, Lord, wilt thou at this time restore again the kingdom to Israel? And he said unto them, It is not for you to know the times or the seasons, which the Father hath put in his own power. Unholy ambition is akin to evil desire and greed in that it is an earnest desire to achieve the most success, power and even wealth. It is all about being the best and having the best. The Bible speaks of unholy ambition and may even call it lust of the flesh, lust of the eyes or pride (1 John 2:16). Genesis 11:4 And they said, Go to, let us build us a city and a tower, whose top may reach unto heaven; and let us make us a name, lest we be scattered abroad upon the face of the whole earth. As humans, we are required to live in the world. As Christians, we are encouraged to abstain from worldly things and walk in the Spirit. Here are some passages that tell us how to concentrate on the things above. Galatians 5:19–21 Now the works of the flesh are manifest, which are these; Adultery, fornication, uncleanness, lasciviousness, Idolatry, witchcraft, hatred, variance, emulations, wrath, strife, seditions, heresies, Envyings, murders, drunkenness, revellings, and such like: of the which I tell you before, as I have also told you in time past, that they which do such things shall not inherit the kingdom of God. Jude 19 These be they who separate themselves, sensual, having not the Spirit. Thank you Pam. Only by God’s Spirit can I avoid these self-inflicted evils. Thank you for pointing them out. As always, job well done sister. Previous post: Should Christians Challenge The Teaching Of Church Pastors? Next post: Are Baby Dedications Biblical?